… turn them into escargots. Lalita Clozel has a great story at the NY Times today about snails that nobody wanted. She writes, “On this storm-weathered tip of Mont Saint-Michel Bay, the sweeping tides have washed away the line between land and sea. Fishermen drive their wheeled boats straight into the bay to gather their harvest: an assortment of shellfish prized all over France. “But now they are finding their nets weighed down by an invasive species: the crépidule, or Atlantic slipper shell, a curious type of sea snail that has spread from the East Coast of the United States. “Oyster and mussel producers here have watched helplessly as the colony has taken over their beautiful bay, flush with phytoplankton, the micro-organisms that make it a haven for all manner of shellfish and tint the water turquoise. “Enter Pierrick Clément, a local entrepreneur who looked at the encroaching Atlantic slipper shell and asked an unthinkable question in a town that has built its livelihood on bountiful seafood: Would people eat the insidious creature? 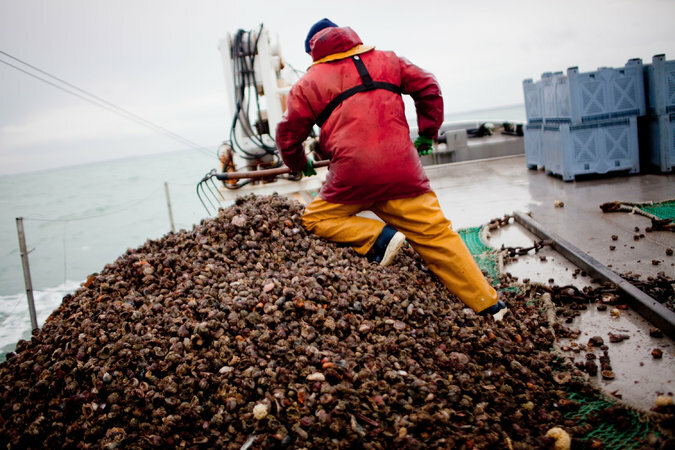 “The community of Cancale now finds itself torn between disgust and relief at Mr. Clément’s project to fish and sell the sea snails for consumption. “His pilot factory, among the bustling oyster plants in nearby Le Vivier-sur-mer, ships to a few stores and restaurants in France, Spain and Germany. “Eventually he hopes to process as much as 100,000 tons of slipper shells per year — enough to offset their growth in the bays.” More here. This entrepreneur’s adaptability fits with what my father used to say about the French secret of beauty. It was along the lines of Feature what you’ve got.